The non-denominational Green River Cemetery was consecrated in 1851 and today is the largest cemetery in Greenfield, Massachusetts, with over 12,000 interments on 58 acres. It occupies a sandy plain bordered by Wisdom Way and Petty Plain Road above the Green River overlooking the town center of Greenfield. While the majority of the site is flat or gently undulating, within the north and east property boundaries are steep, wooded, inaccessible slopes, sections of which are eroding within a few feet of monuments. The former superintendent's lodge, now the newly-renovated Children's Advocacy Center of Franklin County and North Quabbin, overlooks the entrance off Wisdom Way and a no-longer-used, stone Gothic Revival chapel (above photo), central to the Cemetery, is nestled in a pine grove. The oldest part of the Cemetery was designed in 1851 according to the picturesque principles of the then-stylish "rural cemetery". This portion consists of undulating turf and is partially wooded with mature oak and maple trees. A circuitous system of roads separates the grounds into sections of burial lots. Important citizens of Greenfield history are buried here, and many notable monuments attract visitors. 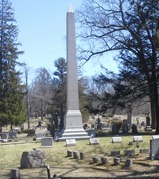 A striking 35-foot obelisk at the family plot of William B. Washburn, former governor of the Commonwealth, can be glimpsed from most of the grounds. A marble bas-relief angel marking the Snow family plot is the only monument of this type sculpted by Daniel Chester French, best known for the Lincoln Memorial statue in the nation's capital. The newer part of the cemetery consists of nine and a half acres of sandy grassland at the southwest of the property. It is flat, exposed to Petty Plain Road and lacks mature vegetation. Currently, two straight, parallel roads provide access to plots, which are part of a recently designed grid pattern. Between these new sections and the older sections lies a narrow, rectangular 3-acre burying ground owned by the Catholic diocese.